Animals on this page are urgently needing to be re-homed or fostered, either due to an adoptant no longer being able to take care of them, or other circumstances out of RSDR's control. If you can adopt please go to our Adopt page and fill out an adoption questionnaire for your relevant country. Press here to be an emergency foster carer for RSDR. Bracken is a four-year-old, medium sized female who we found abandoned in a lay-by with her twelve siblings, in July 2013. 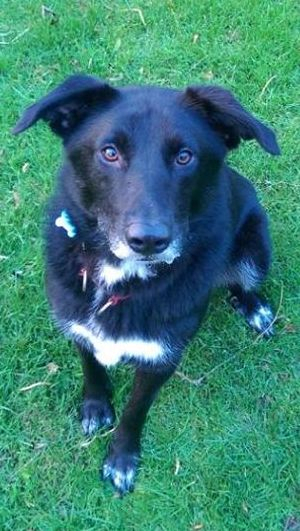 In March 2014, Bracken was adopted and made the long trip to the UK. Poor Bracken didn’t have the best start as soon after she arrived in the UK she was diagnosed with severe hip dysplasia in both hips and had to undergo 3 hip replacement operations (one failed). She has now received a clean bill of health and no further medical care is required. Unfortunately, Bracken’s adopters have asked us to find a new home for her as she has developed some fears and her behaviour has become too challenging for them. They have received some guidance from a behaviourist but having a toddler and considering the possibility of having another child, they feel they are not the right people to help her further. Bracken becomes anxious when people come to the house, is sometimes reactive to other dogs and loud vehicles out on walks, and becomes anxious when strange people, especially men, approach. We are therefore looking for an experienced home for Bracken who are able to control and manage her environment so she is not finding herself in difficult situations and begin a process whereby she can start to feel more comfortable in situations she currently finds difficult. Any potential adopter would need to put in place a predictable ritual for when people come round to ensure that Bracken finds it a positive experience. It is important that her limitations are recognised and she is managed well. Bracken’s adopters have described her as a ‘very calm and loving dog’. She likes the company of her people and loves strokes and cuddles. She knows the basic commands and is housetrained. Bracken really loves running around and playing fetch with her favourite toys. Although she can be reactive to some strange dogs, she has previously lived with one and does have some doggy friends; it may therefore be beneficial for Bracken to live with a stable dog to help her gain confidence. She has also lived with chickens and been fine with them. Bracken has been good with her adopter’s toddler however she does have a tendency to guard him so we feel it would be best she goes to a home where any children in the household are older teenagers. She has been spayed, vaccinated, microchipped and has a pet passport. This lovely girl has been through a lot in her short life so we are looking for a quiet and loving home where she will be given the time and patience needed to help her overcome her fears and help her become the playful, loving dog that she is.